This jackpot slot, made by Novomatic, is an old-school, vintage-style online slot game filled with classic features, music, sound effects and symbols. There’s nothing more satisfying than hearing those reels click into place and waiting for the bell to ring to signal a big win! 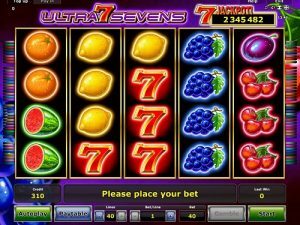 Ultra Sevens is the perfect slot game for beginners as well as for well-seasoned slots players who like old-school games which pay out huge jackpots! Ultra Sevens has a progressive jackpot up for grabs, which means it gets bigger and bigger the more you play and every spin by every person who plays it will contribute to the amount – so you can just imagine how big it gets! Novomatic slots fans who enjoy playing their other slot games, like Hot Chance and Plenty of Fruit Hot, will enjoy this game for sure. This is a 5-reel, 40-payline slot that’s entertaining, colourful and sure to be your next favourite online slot game! This game wouldn’t be called Ultra Sevens if there weren’t sevens on the reels – but, alas, there are, along with 6 other unique symbols which means that Ultra Sevens’ reels have seven individual symbols covering them! Coincidence? We think not! The symbols in this game are all about the fruits and sevens which adds to the old-schools slots vibe. The cherries, plums, oranges and lemons all pay out up to x5 your bet when you spin 5 or more in a winning combination and they all pay out from 3 or more, except the cherries which pay from just 2. The bunch of grapes and the watermelon pay out up to x12.5 your bet if you spin 5 or more in a winning combination and they both pay from 3 or more. Winning combinations of matching symbols are those which fall on one of this slot’s 40 paylines, on consecutive reels starting from the leftmost reel. The paytable shows exact payout amounts for each symbol and it shows them according to the bet value you have currently set. Your bet can be changed easily by increasing or decreasing the number of paylines you want to bet on, as well as the amount you want to bet on each of the active lines. The minimum bet per line is 0.01 so if you want to bet on all 40 lines then the minimum bet per spin will be 0.40. The jackpot amount will be displayed at the top-right of the screen throughout your game and you’ll be able to witness it getting bigger and bigger with every spin! You’ll have guessed right if you thought that the red seven is the symbol that will help get you this slot game’s gigantic jackpot but what you might not have guessed is that there are other symbols that can help you get part way there! Whenever you manage to spin the reels and stop them when every symbol on every reel matches each other (so that would be x20 of the same symbol), you’ll either get the whole jackpot or a percentage of it, depending on the matching symbols! Filling the reels with one of the lower-paying symbols (the cherries, the plums, the oranges and lemons) will give you 10% of the jackpot amount. Filling the reels with one of the middle-paying symbols (so 20 of either the bunch of grapes or 20 watermelons) will pay out 20% of the jackpot amount. Finally, when you spin 20 red sevens and fill every single reel with this symbol, Ultra Sevens will pay you the whole jackpot amount which will be ultra-huge! This slot game is a Novomatic creation and therefore its features are ultra-Novomatic in nature! Play Ultra Sevens here for fun or play it for real at one of our recommended casinos, such as All Britisch Casino. Wins are gamble friendly in this game and you can spice things up by using this much-loved 50/50 chance feature which will potentially help you double (or more) each of your payouts! You can also play Ultra Sevens without having to do a thing, simply by switching it to autoplay and letting it do its thing for you.